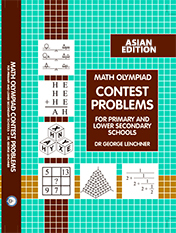 Math Olympiad Contest Problems For Primary and Lower Secondary Schools Asian Edition by Dr. G. Lenchner. • All Olympiad questions remain true to the original. In some situations, the answers may differ from the original answers. Great care has been taken to ensure that the purpose and solution methods remain unchanged. Consequently, one-cent coins will still be used even though they are no longer in use in Singapore. 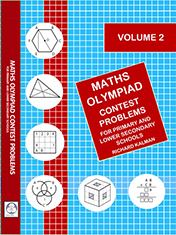 Math Olympiad Contest Problem For Primary and Secondary Schools Volume 2, edited by Richard Kalman. 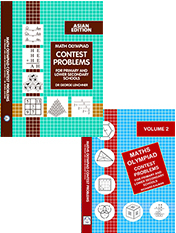 A continuation of our first volume, Math Olympiad Contest Problem For Primary and Secondary Schools, it is full of useful features for PICO and mathlete alike, and can be a valuable addition to your professional library. Its many features include: The 425 problems from our contests from 1995 to 2005; 50 Division E contests and 35 Division M contests; Step-by-step solutions to all problems; Hints, strategies, and percents correct for all questions; Multiple solutions for most problems; Extensions for about half of the questions; An index of problems by type; A thorough handbook for PICOs; and A rich study guide for mathletes.